Theater in the Now: Mary Poppins to Fly Away to Make Room for a Magic Carpet Ride? Mary Poppins to Fly Away to Make Room for a Magic Carpet Ride? If the rumors are true, Disney will have a new show coming to the Great White Way very soon. 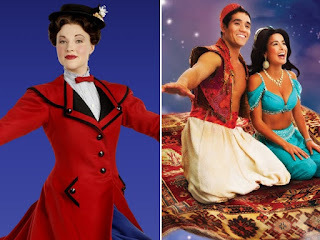 The New York Times and NY Post are reporting that Mary Poppins will be closing on Broadway so Disney can renovate the New Amsterdam Theater to bring in a new production of their hit movie Aladdin. Though no official announcements were made, previous productions of the Aladdin stage musical at 5th Avenue in Seattle and The Muny in St. Louis could be the form the Broadway production follows. What do you think? Will Aladdin be a The Lion King/Beauty and the Beast hit or a Tarzan/The Little Mermaid flop? Are you still like me wishing the folks at Disney would get their brains churning on a Broadway production of "Hercules"?